VATICAN CITY (CNS) — Promoting the secretary of the Congregation for the Doctrine of the Faith to the office of prefect, Pope Francis chose not to ask German Cardinal Gerhard Muller to serve a second five-year term in the post. 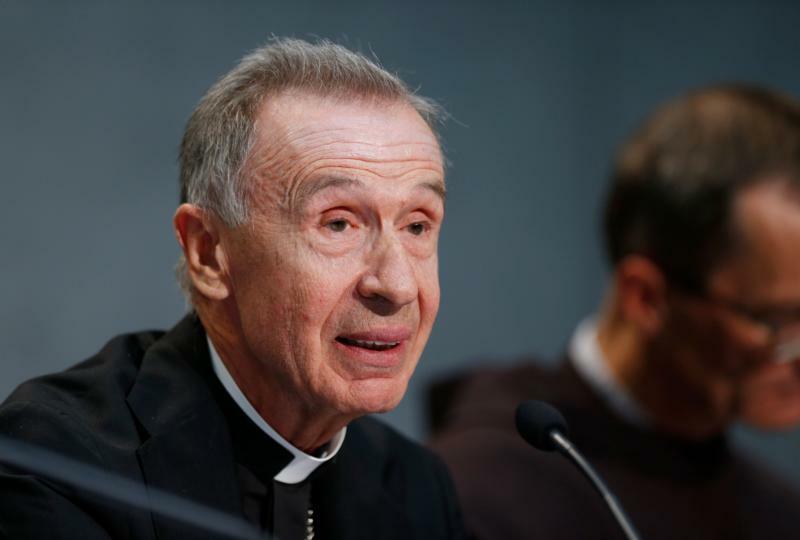 The Vatican announced July 1 that the pope chose as prefect Spanish Archbishop Luis Ladaria Ferrer, 73, a Jesuit theologian who had been appointed secretary of the congregation in 2008 by then-Pope Benedict XVI. “The Holy Father Francis thanked His Eminence Cardinal Gerhard Ludwig Muller at the conclusion of his quinquennial mandate,” the Vatican announcement said. No new position was announced for Cardinal Muller, who at 69 is still more than five years away from the normal retirement age for a bishop. Anticipating an announcement of the pope’s decision June 30, both the English Rorate Caeli blog and the Italian Corrispondenza Romana blog presented the pope’s move as a dismissal of the German cardinal, who originally was appointed to the post by now-retired Pope Benedict XVI. Pope Francis had met that morning with Cardinal Muller, whose five-year term was to end July 2. Both Rorate Caeli and Corrispondenza Romana implied Cardinal Muller was let go because he insisted that divorced and civilly remarried Catholics could not receive Communion unless they made a commitment to abstain from sexual relations with their new partners. Other bishops and bishops’ conferences have read Pope Francis’ exhortation on the family, “Amoris Laetitia,” as presenting a process of discernment that in certain circumstances could allow some couples to return to the sacraments. Cardinal Mueller told the German daily, Allgemeine Zeitung, that “There were no disagreements between Pope Francis and me” and that there had been no dispute over “Amoris Laetitia,” the newspaper reported July 2. The cardinal spoke with reporters while he was in Mainz celebrating his 50th high school reunion July 1 and Mass July 2 commemorating the 29th anniversary of the death of Cardinal Hermann Volk of Mainz, who ordained him to the priesthood in 1978. According to the interview with Allgemeine Zeitung, the cardinal said the pope’s decision had been unexpected since such terms were usually renewed, but that he was not bothered by it. “I do not mind,” he said, adding that “everyone has to stop” at some point. “The five-year term had now expired,” he said. The cardinal told the newspaper that Pope Francis wanted, in general, to limit the term of office to five years and he just happened to be the first person to which the new standard applied. However, he said he regretted losing three staff members of the doctrinal congregation after Pope Francis let them go “a few weeks ago,” according to the German newspaper. “They were competent people,” the cardinal said. He said he would stay in Rome and continue working in pastoral care and continue scholarly, academic pursuits — “continue my role as a cardinal.” He is a member of the congregations for Eastern Churches, for Institutes of Consecrated Life and Societies of Apostolic Life, and for Catholic Education. He is a member of the pontifical councils for Legislative Texts, for Promoting Christian Unity and for Culture. Cardinal Muller was the first Vatican official formally confirmed in his post by Pope Francis after his election in 2013 and was among the 19 churchmen named cardinals that year by Pope Francis. The prefect of the doctrinal congregation is responsible for promoting the correct interpretation of Catholic doctrine and theology; his office also is responsible for conducting investigations of clergy accused of sexually abusing minors. Resigning from the Pontifical Commission for the Protection of Minors, Marie Collins, one of the founding members and the last remaining abuse survivor on the commission, said members of the Roman Curia were reluctant to implement the commission’s recommendations and she particularly cited Cardinal Muller. As head of the doctrinal congregation, the prefect also serves as president the Pontifical Biblical Commission, the International Theological Commission and the Pontifical Commission “Ecclesia Dei,” which is responsible for the pastoral care of traditionalist Catholics and for the ongoing reconciliation talks with the Society of St. Pius X. The new prefect, Archbishop Ladaria, was appointed congregation secretary by Pope Benedict after having worked with him as a member of the International Theological Commission in 1992-1997, as a consultant to the doctrinal congregation from 1995 to 2008 and as secretary general of the theological commission from 2004 until being named congregation secretary. Archbishop Ladaria was born in Manacor, Mallorca, April 19, 1944, and earned a law degree at the University of Madrid before entering the Society of Jesus in 1966. After theology and philosophy studies in Spain and Germany, he was ordained to the priesthood July 29, 1973. Before the debate over “Amoris Laetitia,” Cardinal Muller made headlines for his role in the Vatican critique of the U.S.-based Leadership Conference of Women Religious and for his friendship with Dominican Father Gustavo Gutierrez, considered the father of liberation theology. In 2004, he co-authored a book, “On the Side of the Poor: The Theology of Liberation,” with Father Gutierrez. In the 1990s, when then-Cardinal Joseph Ratzinger headed the congregation before becoming Pope Benedict, Father Gutierrez was asked by the congregation to write and rewrite articles clarifying some of his theological and pastoral points. In a 2012 interview with the Vatican newspaper, then-Archbishop Muller said he was invited to participate in a seminar with Father Gutierrez in 1988, and he went “with some reservations” because the doctrinal congregation had criticized aspects of liberation theology that it said were too influenced by Marxist ideology. Before being named prefect of the doctrinal congregation, Cardinal Muller had served five years as one of its members and had been a member of the International Theological Commission from 1998 to 2003. Pope Benedict led both bodies until 2005, when he was elected pontiff. Cardinal Muller has close ties to retired Pope Benedict and in 2008 helped establish the Pope Benedict XVI Institute, which is publishing a complete collection of works by the German-born pope and theologian. Cardinal Muller is a native of Mainz, Germany. He was ordained to the priesthood in 1978 and served in his native diocese as a chaplain and high school religion teacher. With degrees in philosophy and a doctorate in theology, he was a professor of dogmatic theology in Munich from 1986 to 2002. He was named bishop of Regensburg in 2002 and then-Cardinal Ratzinger attended his episcopal ordination. Then-Bishop Muller chose as his episcopal motto “Dominus Iesus” (Jesus Is Lord), which comes from St. Paul’s Letter to the Romans and is the title of the 2000 document on salvation through Christ alone, issued by the doctrinal congregation under then-Cardinal Ratzinger.